Emily Eveleth is another favorite artist of Brad and mine, who we've collected for many years. 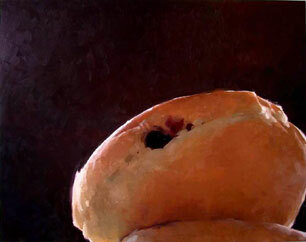 We own several of her large paintings of donuts and are delighted to add Pass to our collection. You can see other images of her work at Howard Yezerski Gallery in Boston and the Danese Gallery in New York. Howard Yezerski Gallery is very pleased to present a new evocative body of work by Emily Eveleth. Growing out of the figurative work that she had done in her last show at the gallery in 2002, this recent body of work features an archetypal figure in a suit and tie playing out an ambiguous scenario of hula hooping. The close, cinematic cropping of the scenes draws attention to the movement of the hoop, and emphasizes the sequencing of events that happens throughout this new series. The close-up nature of each scene in these paintings creates a feeling of intimacy, as though they are suggesting that the viewer has caught this figure indulging in a private moment. By not giving any details as to surroundings, time, or place the figure remains anonymous. I am also a HUGE fan of Emily Eveleth. Came across your blog by accident while Googling her. I am a painter as well. Here is my website if you would like to have a look. Hmm, I love the donuts. Do you know if Evelyn is represented by the gallery or independent? I could see the donuts in the coffee shop ... we have open slots to fill starting in February.